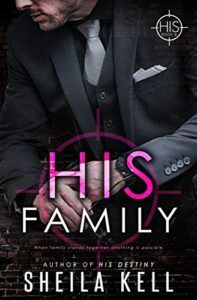 Subscribe to my newsletter and receive a free copy of His Family! Start reading Sheila Kell’s best-selling and award-winning HIS series for FREE! Jesse Hamilton, the head of a private security firm, falls for FBI agent Kate Ross—only to risk losing her forever. Sizzling heat meets nonstop suspense in this fast-paced romantic thriller! *Listen for free with the Audible Romance Package.